I love models with special effects. They just add such a cool cinematic look to them. 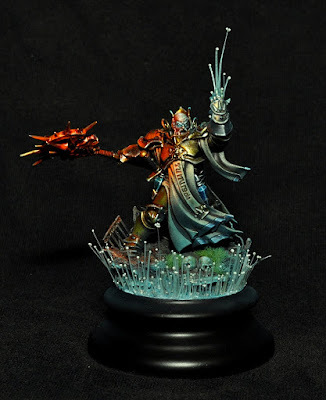 Not only does the Incantor have some awesome object source lighting on him, but the magic itself is represented through the use of some kind of microbead. This is something we've seen before, mostly from David Soper, but it's still an impressive technique, and something I'm sure is hard to get right. I really like the contrast between the blue magic rising from the ground and his hand with the red/orange glow emanating from his staff. Blue and orange are a classic color combo, and one used often to great effect (see every Michael Bay film ever). The blue magic has a real rain feel to it too, which fits the Stormcast perfectly. Everything is smooth and crisp with some great contrast between the shadows and highlights. 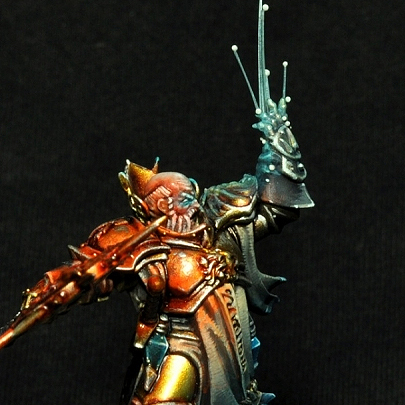 The colors of the Stormcast himself have been kept rather muted, mostly sticking with the gold armor and creams of his robes. Where there is blue, it's kept rather subdued. This allows the lighting effects to become more prominent. The other area with more saturated color is his head, which draws your eyes to it despite the rather bright colors around it. This is just a really cool concept, executed perfectly. Be sure to check it out more view of it on Putty and Paint!